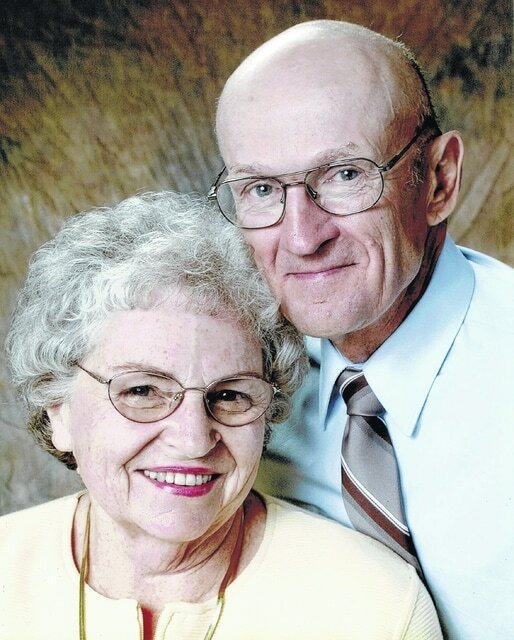 Richard Austin Church and Nancy Alice Sidenstricker Church will be celebrating 60 years of marriage on July 23. They were married at Trinity Baptist Church in Marion, Ohio, on July 23, 1955. Both were raised in the Marion area and met at Marion Harding High School. Richard worked at Whirlpool and farmed during the first years of their marriage. Around 1968, Richard left Whirlpool to farm full time as they moved into their new home close to Ashley, which was built by him on evenings and weekends, when he wasn’t working one of his two full-time jobs. Due to health reasons, he had to quit farming in 1978. He opened his own auto mechanic business which he retired from in 2000. Their son, James Church, has taken over ownership of the business since then and it continues to thrive and be successful. Having just turned 80, Richard still enjoys “farming” his garden and yard, fixing anything that breaks, always helping others with his capable hands and teaching Sunday school at their church. Nancy has enjoyed her role as wife, mother, homemaker and bookkeeper for Oxford Automotive over these 60 years. Together they have had eight children, one of whom passed away at the age of 4. The remaining seven children are Lynn (Church) Karbowski of Wisconsin; Stephanie (Church) Stover of Ashley, Ohio; Melinda (Church) Clendineng of Hilliard, Ohio; Amy (Church) Knoll of Wisconsin; David Church of Delaware, Ohio; James Church of Delaware; and Ruth (Church) Young of Delaware. They also have 31 grandchildren and 21 great-grandchildren. A public celebration is being held in their honor by their children on Saturday, June 27, from 1 to 4 p.m. at Calvary Bible Baptist Church, 1419 Linn-Hipsher Road, Marion. Cards of celebration can be sent to 236 Rutherford Ave., Delaware OH 43015, in care of Richard & Nancy Church anniversary celebration.